Well that was a sudden finish. The three remaining players took about 20 minutes to come to a fair conclusion on a deal and once that was decided they all agreed to shove blind for the title. As luck would have it, it was chip leader Daniel Laidlaw that will go down as the official champion when he picked up K-Q which held on a board of 5-9-A-9-2 against the Q-6 of Tony Kambouroglou and the 8-3 of Michael Kanaan! Just like that, Daniel Laidlaw is the latest Sydney Championships main event winner. Congratulations Daniel! What originally looked like it would be a quick afternoon following a spate of early eliminations instead turned into quite a grind as play ground to a halt with five players remaining. We saw some incredible things at the table today – none more stunning that Kwong Phung’s ability to come back from extreme short-stacked situations. However, having twice hit miracle cards to double up, he eventually fell in fifth spot which was the spark for another long battle between Laidlaw, Kanaan, Kambouroglou and Aaron Benton. And so we say goodbye to another year of the Sydney Championships here at The Star. Despite the buy-in to this year’s event almost doubling from $1,650 to $3,000, the field of 227 saw us easily beat last year’s prize pool and we congratulate poker managers Stephen Ibrahim and Julie Smedley for the success of the event. Thanks for joining us here at PMA and we look forward to returning to The Star in December for the Star Summer Series which will link with the NPL for the first time in 2013 in what promises to be a massive event. Ciao for now! The remaining players are currently involved in an animated discussion about a deal and the calculators have all come out to try and reach a suitable agreement. Aaron Benton (pictured below) opened from the small blind to 80,000 and Tony Kambouroglou made the call. They took a flop of 6-7-J and Kambouroglou called Benton’s c-bet. The turn was a repeat 6 and put two spades on the board. Benton announced he was all-in and Kambouroglou went deep into the tank. Eventually he stood up, shuffled his chips and called, showing J-9. Benton held 9-4 of spades for the flush draw but the river blanked and Benton hits the rail in fourth. We’ve still got four players remaining but with the blinds rising we’ve hit that point where a lot of opens are being met with a 3-bet shove. So far no one has made the call but it is obvious the rail can sense something is about to crack soon. Aaron Benton has been playing games with Tony Kambouroglou, having 4-bet shoved on him twice now in the past 10 minutes. Kambouroglou has folded both times after a lengthy deliberation and is down to 800,000 while Benton has 1.3 million. Players are back with blinds now at 20000/40000 with a 4000 ante. Now flush with newfound chips, Daniel Laidlaw is starting to apply the pressure. In a hand just played against Tony Kambouroglou, Laidlaw bet 75,000 in position on a 4-5-8 flop and was check-raised to 200,000. He didn’t waste too much time before announcing he was all-in with Kambouroglou eventually folding. He is down to 550,000 while Laidlaw is approaching 1.5 million. And just like that Daniel Laidlaw scores that much-needed double-up, albeit thanks to some extremely good fortune. Michael Kanaan opened the button to 65,000 and Laidlaw shoved over the top. Kanaan called and showed A-A to be way ahead of Laidlaw’s K-Q. However the flop gave him outs when it fell 4-J-10 and the turned A gave him a Broadway straight. The river was a 7 and Laidlaw chips up to 1.2 million while Kanaan slips back to about 1.8 million. The clock has ticked over into a new level with blinds at 15000/30000 with a 3000 ante. Michael Kanaan is continuing to dominate with about half the chips in play while both Daniel Laidlaw and Tony Kambouroglou have slipped under 20 big blinds and will be looking for an opportunity to double. Kwong Phung’s (pictured below) topsy-turvy run has finally come to an end. He shoved for his last 150,000 from the small blind with J-8 and was called by Michael Kanaan holding a dominating K-J. There was no miracle this time for Phung as the board ran out A-A-4-J-Q to send him to the rail. The two big stacks just clashed in a sizeable pot with Michael Kanaan putting Tony Kambouroglou to the test for all of his chips. The hand began with Kanaan raising in position and Kambouroglou making the call. The two checked the 3-2-2 flop to see an 8 land on the turn. Kambouroglou then check-raised Kanaan’s 65,000 bet to 150,000. Kanaan called. When the Ace landed on the river, Kambouroglou led out for 180,000 but Kanaan soon announced he was all-in for his remaining 1.4 million. Kambouroglou tanked for two minutes before eventually mucking. In poker we often talk about the rollercoaster rides of players through a tournament, yet it is hard to imagine anyone enduring the ups and downs that Kwong Phung has over the past 24 hours. Late last night he was left with just 60,000 in chips after his K-K was cracked by the A-K of Phi Yuu, yet he staged a stunning recovery to move back over 600,000 by the end of the day. Earlier today he was crippled again and left with just 40,000 in chips but managed another recovery to stay in contention. His story gets even more amazing, however, when you consider two recent all-in situations. The first came when he was all-in with A-K against the K-K of Brad Fowler and A-Q of Aaron Benton. Phung was on his way out the door when the flop came A-K-Q but running diamonds saw him scoop the pot to triple up. And just now he was all-in again against Daniel Laidlaw holding J-10 v Laidlaw’s K-9 on an A-K-K flop. The turn was a 5 but the river Q saw him hit a four-outer for the straight. What other magic tricks does he have in store for us tonight? Players are back from their dinner break with blinds at 12000/24000 with a 3000 ante. After a run of short-stacks hitting miracle cards to stay alive, Brad Fowler (pictured below) made the mistake of getting it in good. After Daniel Laidlaw opened to 40,000, Fowler shoved for 249,000 total and after some deliberation Laidlaw made the call with A-8cc. The flop was a huge one for Laidlaw as it came A-5-K with two clubs and when the 9c landed on the turn Fowler was drawing dead. It took two-and-a-half hours to lose our latest player but finally the circle of chips has been cracked. It’s hard to explain what we’ve witnessed in the past 10 minutes. It began when Daniel Laidlaw crippled Kwong Phung, with the latter down to just 62,000 in chips. But just like yesterday, Phung won consecutive races to stay alive and move back over 200,000 in chips. Then came the following hand. Aaron Benton raised to 32,000 from early position and Brad Fowler called. Phung then shoved for a touch over 200,000 from the blinds. Benton asked for a count then shoved all-in over the top. Fowler insta-called and the cards were tabled with Phung showing A-K, Benton A-Q and Fowler K-K.
Incredibly, the flop fell A-K-Q leaving Benton in trouble and Fowler in great shape to triple up and eliminate Phung in the process. However, a third diamond on the turn gave them all a sweat with Phung holding the only diamond. You guessed it, the river brought the fourth diamond and suddenly Phung is right back in contention. Benton loses some chips and Fowler is now our critical short stack. It’s been a bit of a rollercoaster ride here with Kwong Phung and Daniel Laidlaw both crippled in recent hands only to double through to stay alive. Nevertheless, both remain in some trouble and will need a few more doubles if they are to challenge for the title with Michael Kanaan and Aaron Benton really starting to assert their authority at this final table. Players have returned from their first 10-minute break of the day with blinds now at 8000/16000. The first hand back saw Aaron Benton call Brad Fowler’s open before leading out on an 8-8-6 flop with two hearts for 55,000. Fowler bumped it up to 115,000 but Benton immediately announced he was all-in. Fowler folded. Michael Kanaan and Daniel Laidlaw have just clashed in a huge pot that has seen Kanaan rocket into the overall chip lead. It began with Laidlaw opening to 25,000 in early position and Kanaan making the call from the blinds. The flop came 3-K-7 with two diamonds and Kanaan check-called a bet of 35,000. The turn was a Q and this time Kanaan led out for 75,000. Laidlaw thought briefly before re-raising to 177,000. Kanaan eventually called. The river was the Jd and Kanaan pushed out three stacks of chips totalling 300,000. Laidlaw again thought for only a few seconds before tossing out a yellow chip to signify the call. Kanaan flipped over A-10 for the rivered Broadway straight and Laidlaw mucked. That hand has certainly changed things with Kanaan now well over the million mark with 1,470,000 while Laidlaw slips to 330,000. No sooner had the players finished congratulating Robert Spano on his deep run than Michael Doodson (pictured below) was shipping his last 185,000 into the middle with Kwong Phung making the call. Doodson held A-6 and would need an A to survive against Phung’s 10s but he received no help on the Q-6-3-3-9 board. We’re down to six! Robert Spano (pictured below) has been eliminated after losing a race to Tony Kambouroglou. The action started with Aaron Benton opening to 25,000 (blinds at 6000/12000) and Spano 3-betting to 60,000. Kambouroglou then shoved for around 400,000 with Spano making the call. The flop came 6-8-K to shoot Kambouroglou into the lead and when the board ran out with a 3 and a 7 we were down to our final seven players. Michael Weiss (pictured below) is the first casualty from our final table after picking the wrong time to battle with Michael Kanaan. Kanaan opened in the cut-off to 20,000 and Weiss 3-bet to 60,000 from the button. Aaron Benton considered his options before eventually folding but Kanaan shipped over the top – easily covering Weiss. Weiss made the call and tabled A-8 but was trailing the 9s of Kanaan. The board ran our K-Q-2-4-10 and Weiss is yet another victim of the Kanaan phenomenon! Kanaan is up to 900,000 after that hand. Just moments after Robert Spano survived an all-in against Michael Kanaan to double again, Sailendra Sha (pictured below) was all-in with 6s against the A-Kss of Aaron Benton. The flop gave Benton plenty of outs as it fell 3-Q-7 with two spades and when the 4s landed on the turn it was all over for Sha, who just couldn’t gain any traction today. We will now redraw for the final table. Phi Yuu (pictured below) might be regretting a surprising lay-down he made late last night when he open-folded Q-Q to Michael Kanaan’s 4-bet shove despite having just 20 big blinds behind. He is the first eliminated today and you guessed it, it was Kanaan that did the damage. Yuu opened in the cut-off and received a call from Kanaan on the button and Kwong Phung in the blinds. The flop came J-2-4 and Yuu led for 26,000 with Kanaan calling and Phung folding. The turn was a K and after Yuu bet 60,000, Kanaan re-raised to 155,000. Yuu then shoved for 200,000 more with Kanaan calling instantly and tabling K-J to have out-flopped Yuu’s A-K. The river was the 8 and Kanaan just has Yuu out-chipped to send him to the rail. Kanaan is up to 670,000. The tournament short stack, Robert Spano, has just doubled through Phi Yuu to stay alive. Spano shipped with 5-5 for 96,000 and was called by Phi Yuu holding A-10. The J-J-5 flop was a great one for Spano and by the time the 8 landed on the turn the hand was his. He is back up to 200,000 although with 20 big blinds he still has work to do. Aaron Benton has been busy early. We just caught a hand involving the 2009 APPT Sydney champion in which he called a bet of 32,000 from Sailendra Sa on the turn with the board reading J-Q-7-J. The river was a repeat 7 and this time Sa bet 60,000. Benton thought for a minute before making the call with A-K. Sa flashed a 4 before mucking. 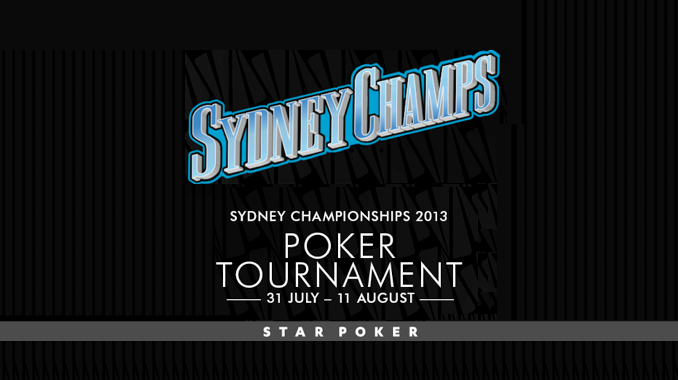 Welcome back to PokerMedia Australia and our coverage of the 2013 Sydney Championships. Today is the final day of this year’s main event as we prepare to crown our latest champion. They will join Jarred Graham, Andrew Capelin, Errolyn Strang and Dean Yuen as former winners here at The Star as well as taking home a first prize worth $165,256. However, with 11 players returning today our first task will be reaching our official final table of nine. 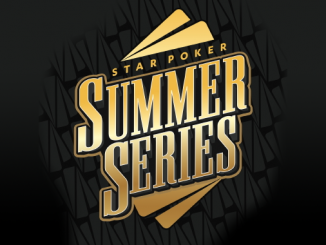 Looking good for a deep run is chip leader Daniel Laidlaw with 728,000 while Aaron Benton, Michael Kanaan and Tony Kambouroglou are also among the remaining field. Play is scheduled to begin in about five minutes so stay tuned here at PMA as we bring you all the live action of the 2013 Sydney Championships main event final table.